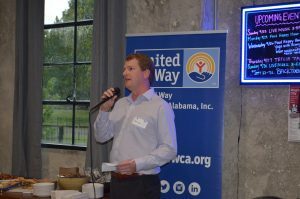 UWCA Young Philanthropists Society Hosts Kickoff Event – United Way of Central Alabama, Inc. 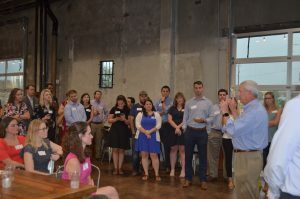 Since this was an event for young professionals, Jones switched his focus and talked about how Birmingham is a great place for young people wanting to be philanthropic and involved in the community. He also discussed how philanthropy became a big part of his life at a young age. In fact, his wife’s family has been extremely involved in United Way from the very beginning with her great-great-grandfather being one of the Community Chest founders, the organization that is United Way of Central Alabama today. Young Philanthropists Society is currently accepting new members. As a member of this organization, you will have the opportunity to learn more about community needs and the work being done through lunchtime tours of partner agencies and chances to hear from experts in the field. YPS members also get the chance to take part in hands-on volunteer projects throughout the year, and invitations to network with like-minded peers, as well as corporate and community leaders. For more information, contact Elizabeth Ragland at eragland@uwca.org.